Purple hair might not be a naturally-occuring hair color, but that doesn’t stop people from dyeing their hair in order to achieve this pretty hue. In order to get a really vibrant and healthy-looking color, you need to find the right dye, and treat your hair properly after coloring. With plenty of shades in both permanent and semi-permanent formulas, you’re sure to find a purple hair color to suit your needs. And if you’re not ready to change your hair color with a dye, you might find that a good makeup kit, contour kit, or a set of eyelash extensions are a great alternative to help you update your look. Finding the best purple hair dye for your hair means reading reviews, studying product features, and diving into the ins and outs of available shades and dye formulas. With the right purple hair dye, switching up the color of your locks can become a quick, over-and-done with task. We reviewed dozens of purple hair dyes to identify the best of the best, based on Amazon reviews, how well they performed in tests, cost, and other considerations. We narrowed our search down to 5 of the top-rated purple hair dyes people can purchase to ensure a bright and vibrant hue. Semi-permanent formula that conditions hair as it colors. We’ve identified Special Effects SFX Hair Color Hair Dye as the best purple hair dye out there. With a semi-permanent formula that conditions hair as it colors, this purple hair dye is one that will keep your locks looking tip top shape. These benefits allow you to put your best foot, and locks, forward. Special Effects SFX Hair Color Hair Dye took the top spot on our list of the best purple hair dyes thanks to its easy-to-apply semi-permanent formula that conditions hair as it colors. The vegan-friendly dye boasts a non-drip cream formula, and is available in a wide variety of hues to suit any style. It last around 3-4 weeks on most hair, but will last even longer on bleached or pre-lightened locks. Those who purchased and reviewed this purple hair dye appreciated that it was easy to apply and offered a long-lasting color. Some users found that this dye would stain porcelain or ceramic tiles, and recommended rinsing or washing hair in a metal sink for the first few cleanses after application. With a price tag of about $14, it’s pretty pricey, but the long lasting color, as well as the ease of setup and use more than justifies that price. It has a rating of 4.6 on Amazon with nearly 300 people reviewing it, which we think goes a long way in convincing people to make the investment. Intensity-enhancing color boost technology transforms even the darkest bases. 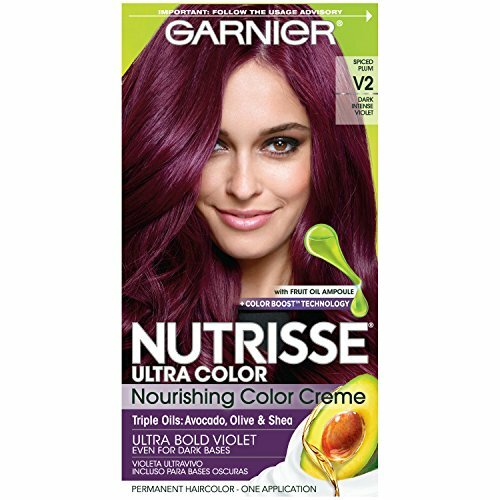 Garnier Nutrisse Ultra Color Nourishing Hair Color Creme, V2 Dark Intense Violet took the runner-up spot on our list of the best purple hair dyes, thanks to its intensity-enhancing color boost technology, which easily transforms even the darkest bases to a rich purple hue. It contains avocado, olive, and shea oils to help nourish hair, and boasts a non-drip cream formula that’s easy to spread. Those who purchased and reviewed this purple hair dye appreciated that the color lasted a long time and didn’t fade, although people did say to expect major color bleed with washes. Those with dark hair liked that they could see noticeable color with this dye, and felt it improved the condition of their hair. At a cost of around $13, it’s not overly expensive, and the quality craftsmanship associated with the brand, as well as the ease of setup and use more than justifies that price. It has a rating of 3.5 on Amazon with more than 750 people reviewing it, which we think goes a long way in convincing people to make the investment. A budget-friendly option with a vegetable-based formula. Punky Semi Permanent Conditioning Hair Color is a good choice for those looking for a purple hair dye option that won’t break the bank. It boasts a vegetable-based formula that provides semi-permanent results, and leaves hair looking vivid and smooth. It uses a color-enhancing keratin complex to provide richer, longer-lasting color. There is no special toner or developer required. Those who purchased and reviewed this purple hair dye appreciated that it lasts for up to 25 shampoos, and conditioned hair while it colored. People also liked that it could be used on bleached or pre-lightened hair, in addition to naturally darker hues. Reviewers liked how vibrant the color turned out, but did caution that it bleeds a fair amount during washes. At a cost of approximately $6, this purple hair dye is a solid choice for those looking for a purple hair dye option on a budget. It has a rating of 3.9 on Amazon with more than 500 people reviewing it, which we think goes a long way in convincing people that this budget-friendly pick is just as good at coloring their tresses as its more expensive counterparts. Easy to apply, with no activator or developer needed. Sparks Long Lasting Bright Hair Color, Lala Lavender is a great choice for those who aren’t afraid to commit to a purple hair color, as it boasts a permanent formula. It requires no special activator or developer to create a rich, vibrant result, and is best applied on hair that has been pre-lightened. (If you’re wanting a look that’s a bit bolder, the Purple Passion shade is also a popular choice.) The brand also makes a line of color-protecting shampoo, conditioner, and leave-in spray to help prolong the life of your color. Those who purchased and reviewed this purple hair dye appreciated that it conditioned as it colored, to help leave hair looking and feeling healthy. People said the color turned out as vibrant as they expected, even on ethnic hair. At a cost of around $7, it doesn’t come cheap if you need to dye your entire head, but for smaller sections of hair, the ease of setup and use more than justifies that price. It has a rating of 3.5 on Amazon with nearly 2,000 people reviewing it, which we think goes a long way in convincing people to make the investment. High dimension color in a highly pigmented formula. Joico Intensity Semi-Permanent Hair Color, Amethyst Purple is an excellent choice for those who aren’t quite ready to fully commit to a purple hue, and are looking for a semi-permanent purple hair dye option. The formula boasts intensely concentrated pigments designed to help you create over-the-top vibrancy that lasts for up to 15 shampoos. It can be applied right from the tube, or mixed to create a custom color. Those who purchased and reviewed this purple hair dye appreciated that it provided a long-lasting result, even if it bleeds a bit with each wash. While the ultra thick formula doesn’t drip, some users felt it made application a bit tricky, but they thinned the dye out with some additional conditioner. Even those with dark and ethnic hair liked how vibrant this dye turned their strands. With a price tag of about $10, it doesn’t come cheap if you need to dye your entire head, but for smaller sections of hair, the ease of setup and use along with its results more than justifies that price. It has a rating of 4.4 on Amazon with more than 300 people reviewing it, which we think goes a long way in convincing people to make the investment. A purple hair dye is an ideal choice for those who want to switch up their natural hair color to a more exciting hue. Nearly anyone can dye their hair purple if they like, and doing so at home is often significantly less expensive than having your hair colored at a salon. Whether your hair is light or dark, straight or curly, there is an at-home purple hair dye that’s right for you. With plenty of hues in both permanent and semi-permanent formulas, you’re sure to find a purple hair color to suit your needs. If your hair has been previously colored, you are best to do a strand test before applying the dye to your entire head of hair, and you might even want to consult with a professional colorist. If your hair has never been colored before, you should be good to go, but it’s always wise to do a strand and allergy test before doing a full application. Before dyeing, make sure you have a good mirror set up so that you can see what you’re doing. Permanent vs. semi-permanent. Arguably the most important consideration when it comes to choosing a purple hair dye is the type of formula. Permanent dyes will offer a permanent, longer lasting result than a semi-permanent dye will. Purple is a notoriously hard color to maintain, and you’ll want to be mindful of how frequently you wash as color will bleed each time. Shade. The next most important consideration when it comes to picking a purple hair dye is the shade of purple you choose. Most dyes include a color chart on the side of the package that shows you what result you can expect based on your starting hair color. That said, you should still perform a strand test ahead of coloring in order to be sure you’ll like the results and get timing correct. Sometimes you will even need to bleach your hair beforehand to help the color adhere better. Conditioner. Dyeing your hair, especially purple, can wreak havoc on the condition of your hair. Look for dye kits that contain added conditioners in the formula — avocado oil, shea oil, and other oils are all good ingredients — as well as a post-dye conditioner. Price point. Finally, consider how much you are willing to spend on a purple hair dye. Purple hair dyes vary in price from $5-$30 or more. You can frequently find manufacturer’s coupons that can make buying a purple hair dye more affordable. Does purple hair color fade fast? Depending on whether you choose a permanent or semi-permanent hair dye will factor into how quickly your purple hair dye will fade. Also, the more frequently you wash your dyed hair, the faster it will fade. The longer you can go between washes, the longer your color will remain vibrant looking. Purple hair does does contain less pigment than other colors of dye, so will still fade faster regardless of how well you care for it. How light does your hair have to be to dye it purple? The final shade of purple that you want to end up with with generally determine how light your hair should be to start. That said, for the best, longest-lasting results, you want your hair to be a pale yellow before you dye it purple. Pale shades of purple require the lightest base color, whereas darker purples can be applied to darker starting colors. How do you wash purple hair? Washing purple hair can be tricky — wash too frequently or with too hot water, and you’ll fade your color prematurely. You can make purple hair dye last longer by avoiding washing it too much. When you need to wash it, ensure you use a color-safe shampoo and conditioner in order to help protect the color. Washing your hair with the coldest water you can stand will help preserve the color longer than using hot water will as well. Some purple hair dyes come with a special conditioner to help preserve your color, so use as directed to help maintain the color. Finally, avoid applying heat to your dyed hair, including blow drying, and using a curling iron or straightener. How many washes does hair dye last? How many washes a hair dye lasts will depend on a number of different factors. Semi-permanent purple hair dye doesn’t contain any chemicals, such as ammonia or peroxide, and as such it wears off in about three weeks or so, whereas permanent purple hair dye contains slightly more chemicals which make it last around 6 weeks or longer. If you’re using shampoos containing sulfates and alcohol, washing with hot water, and washing daily, your purple hair dye won’t last very long. However, with proper care, you should expect your color to last a couple of weeks for semi-permanent formulas, and several weeks for permanent dyes. We looked at 20 other purple hair dyes. Even though they didn’t make our 5 best purple hair dyes list, they’re the best of the rest and each is still a great option for your coloring needs. The information you’ll need to compare each one is included with the listing. This permanent purple hair dye boasts a rich, long lasting cream formula with rich pigments for sensational color that lasts several weeks. This permanent purple hair dye provides permanent, vibrant, and contemporary color, and boasts an easy-to-apply cream consistency for ease of application. This permanent purple hair dye boasts a non-drip formula, and is free from ammonia. It contains 60% oils in order to be gentler and more nourishing on hair. This permanent purple hair dye boasts an easy-to-apply cream formula, and contains jojoba oil to help nourish hair. The pre-color serum helps improve results. This permanent purple hair dye provides a radiant color to locks both light and dark. Just be mindful that this dye does not include English directions, although they are easy enough to find online. This temporary purple hair dye includes botanical infusions and conditioners to help your hair look its best and boasts an ammonia-free, PPD-free, and formaldehyde-free formula. This temporary purple hair dye boasts a natural formula containing coconut oil and yuzu-cranberry fragrance. The cream-based formula is easy to apply. This temporary purple hair dye features highly pigmented velvet tones designed to be long lasting. It is non-damaging to hair and does not require the use of a developer. This temporary purple hair dye boasts a 95% natural formula including quinoa proteins to help color last longer, increase moisture retention, and fortify hair. This temporary purple hair dye lets you color your hair while you cleanse it, and gently deposits color onto strands as it conditions. This temporary purple hair dye is suitable for use on both on light and dark hair, and can be mixed for a custom color. It gradually fades in 4-6 weeks, and is PPD-, paraben-, and ammonia-free. This temporary purple hair dye offers a vibrant, long-lasting color. It is best applied to pre-lightened hair, but no special developer is required. This temporary purple hair dye works best on blonde or pre-lightened hair, and contains no ammonia or peroxide. It comes complete with gloves and an applicator brush. This temporary purple hair dye helps to give hair a beautiful, soft feel and contains no alcohol, peroxide, or ammonia to damage hair. This temporary purple hair dye provides a rich, deep color that can be mixed and matched for a custom shade. No developer or lightener is required. This temporary purple hair dye boasts a wax formula for quick and easy application and styling, and offers a matte finish. 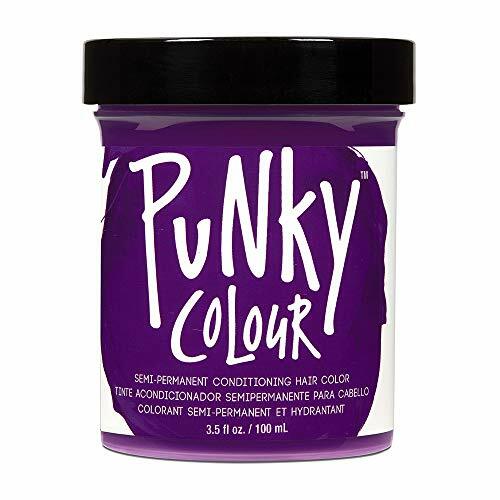 This temporary purple hair dye is free from PPD, ammonia, peroxide, and parabens, and offers bright, vivid color in a ready-to-use non-drip formula. This temporary purple hair dye boasts a wax formula that lets you easily style your hair while providing excellent color coverage. It is made with 100% natural ingredients. This temporary purple hair dye lasts for 3-6 weeks per application, and contains a color-enhancing keratin complex for more intense shine and less breakage. This temporary purple hair dye comes in a chalk-based formula that’s suitable for use by people of all ages. It easily applies with a swipe of the comb container, and can be used on all hair colors.